George Orwell might have created something like Brazil if he had had a sense of humor. But since he didn’t (at least not any that shows up in his work), the task was left to Terry Gilliam to create this absurd, dark, tragic, yet hilarious look into a dystopian world of bureaucracy gone mad. A controversial film with a troubled history and four different versions, Brazil combines frightening social commentary with brilliant comedy. Criterion just released this Blu-ray, along with an extensive collection of extras. Set "Somewhere in the 20th Century," and obviously in England, Brazil follows the adventures of Sam Lowry, a lowly government bureaucrat who wants to remain a lowly government bureaucrat (Jonathan Price). But when the wrong man is arrested and dies under torture, and Sam consequently meets the woman of his dreams, his already-teetering world comes crashing down. The real star of the film isn’t Price (who’s wonderful), but the society in which his character lives–a place overwhelmed with odd-looking and barely working technology, and a cruel, heartless bureaucracy. Every room is filled with wide ducts carrying..who knows what. Televisions and computers have tiny screens, with larger magnifying screens in front of them. (The film was made in 1985, when home computers were still a novelty, yet it predicts a world where people can sneak peaks at movies while the boss isn’t looking.) Automated gadgets are overly complex and always breaking down. Every so often, something blows up. The government blames these explosions on terrorists, but you can’t take this government at its word. The explosions could easily be the result of a badly-designed, crumbling infrastructure. It doesn’t matter, of course. The "terrorist" bombings gives the government an excuse to arrest anyone who may be the slightest bit suspicious, torture them for information, and then bill them for the expenses. ("Don’t fight it," a friendly guard tells a victim awaiting torture. "It could ruin your credit rating.") The department that tortures prisoners is called Information Retrieval. Michael Palin–like Gilliam a Monty Python veteran–plays the torturer as an outwardly nice guy, somewhat smarmy, and professionally ambitious. He always has a friendly smile. Sam escapes from the horrors of his society by dreaming. When he sleeps or daydreams, he’s a heroic figure with wings, soaring through the skies and rescuing a fair maiden from assorted villains. These dreams tell us a lot of Sam as a person–he’s an inept fool who wants to be a superhero (I can identify with that). His heroic desires will lead to both tragedy and an odd sort of victory. For all its dark subject matter, Brazil is an extremely funny movie. Gilliam’s extraordinary sense of visual humor provides the machines gone wild, the army of bureaucrats dancing down the hall, and some near-perfect and highly original double takes. His screenplay collaborators, Tom Stoppard and Charles McKeown, add a layer of that wonderfully British, low-key verbal wit. Robert DeNiro, in what I believe was his first comic role, steals a few scenes as a heroic repairman. There’s no point discussing Criterion’s Blu-ray without first covering the film’s problematic history. Universal Pictures and 20th Century-Fox jointly financed Brazil, with Universal owning North American rights and Fox the International ones. 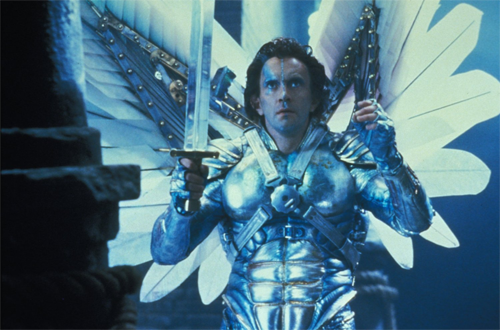 Gilliam’s contract gave him final cut, provided the film was no longer than 120 minutes. Gilliam turned in a 142-minute cut, which Fox immediately released in Europe. That explains why this version is generally called the European Cut. But Universal executives hated the film. They were horrified to discover that Gilliam had used their money to create a work of art. Hoping to please them, Gilliam recut it, but could only get it down to 132 minutes–a version now known as the American Cut. Universal took the movie away from him, and started massively reworking it, making Sam a much more of a conventional hero, and giving the picture a happy ending. While the studio was butchering his film, Gilliam took the fight public, with an ad in Variety and special screenings of the American Cut. Based on these screenings, the Los Angeles Film Critics Association proclaimed Brazil the Best Film of 1985. That shamed Universal into releasing the American cut, but it also pissed them off. They continued to work on their own version, and when the film’s theatrical run was over, they sold their 94-minute "Love Conquers All" cut to television. Meanwhile, the European Cut–which could reasonably be called the director’s cut–was occasionally screened here in American. Eventually, Universal made this one available for revival theaters. In the 1990s, Criterion approached Gilliam about doing a Director’s Signature Laserdisc release. He accepted, but chose to create yet another version. This one, sometimes called Terry’s Final Cut, and running 143, became the new standard–and has been released on DVD and Blu-ray by both Universal (bare bones) and Criterion (lots of extras). It is not, I believe, significantly different than the European Cut. Criterion ships the two-disc Brazil in a standard-sized, clear case. Unfortunately, it’s one of those cases where disc 1 is over disc 2, so you have to remove it get to the second disc. The first disc is tricky to remove, and the second one is much worse. I’m always worried that I’m going to break one. It also comes with a thin book that includes a sometimes-interesting but uneven essay by David Sterritt. Terry Gilliam likes to fill his movies with small, visual details. And he never did that more than in Brazil–his first film on a Hollywood budget. Criterion’s transfer does justice to Gilliam’s vision, allowing you to examine, appreciate, and wallow in Gilliam and his collaborators’ wild imaginations. The absurd, overly-complicated machinery, the dank ugliness of the homes and factories, and the comic facial expressions all come out here better than they ever have before in a home video format. Brazil cries out for Blu-ray. Like most Hollywood movies of the 1980s, Brazil was originally released in the 35mm Dolby Stereo format. This involved two-track stereo media, and some electronic wizardry to send the sounds from those two tracks in four separate directions–left, center, right, and surround. Most home theater sound systems can decode that electronic wizardry, referred to now as Dolby Surround 2.0. So it’s appropriate that Criterion has provided Brazil in a Dolby Surround 2.0 soundtrack, mastered with DTS-HD Master Audio lossless compression. In other words, it’s the original theatrical mix, only it sounds better. Much better. 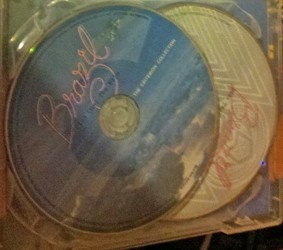 When Criterion released Brazil on laserdisc, they included a mammoth selection of extras, all of which were ported to the three-disc DVD boxed set, and now to the two-disc Blu-ray package. This time around, they’ve updated some of the extras. This disc contains Terry’s final cut of the film. The only extra is Gilliam’s commentary, which is well-worth listening to. But there are two extras I wish were on this disc. Criterion should have used Blu-ray’s seamless branching technology to include the European and American cuts, as well. The biggest extra on this disc is the 94-minute Love Conquers All version. I found this too depressing to watch until I tried it with David Morgan’s fascinating commentary. With that, it’s a must for any Brazil fan. One irony here: In some ways, this is the more radical version, since the happy ending celebrates violent revolution against society. You also don’t want to miss The Battle of Brazil, a 55-minute documentary on the various versions and the controversy surrounding them. Another doc, "What is Brazil," was shot as during the film’s production. It’s breezy and fun, but not essential. A section called "The Production Notebook" contains short docs on how the film was made. It covers screenwriting, storyboards, design, special effects, fashion, and the musical score. This section has been improved since the Laserdisc and DVD versions, replacing screens to text with narration. Brazil deserves royal treatment. Criterion has provided it.